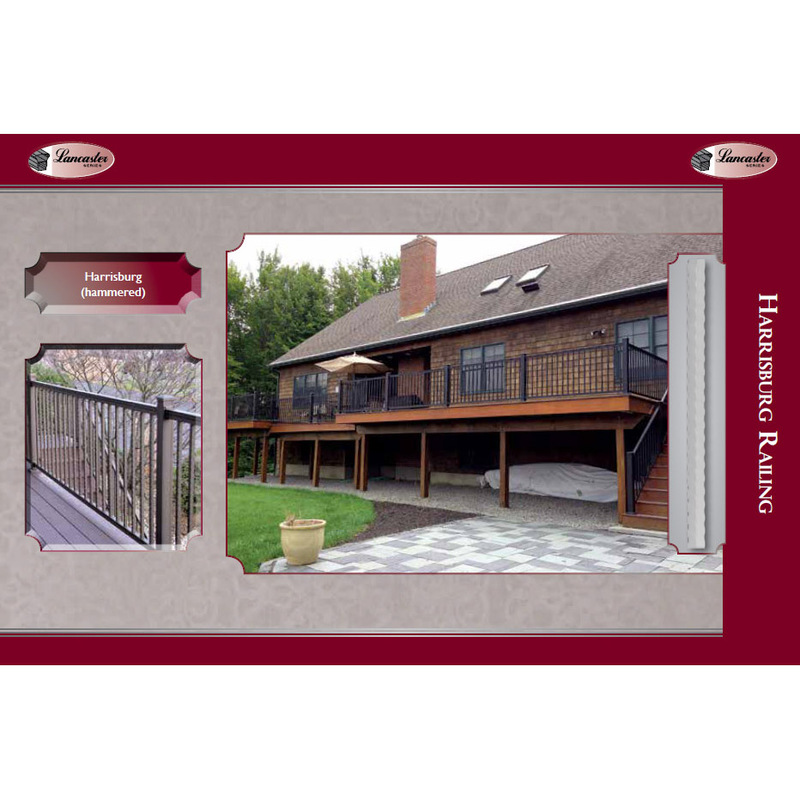 Key-Link Lancaster Series Aluminum Railing - Sections | Hoover Fence Co. Homeowners and professionals alike are choosing aluminum railing not only to solve safety problems, but also because of their beautiful decorative features, easy one man installation and maintenance free aspects. The Lancaster style railing features heavy duty angled top rail with a finish available in three colors. 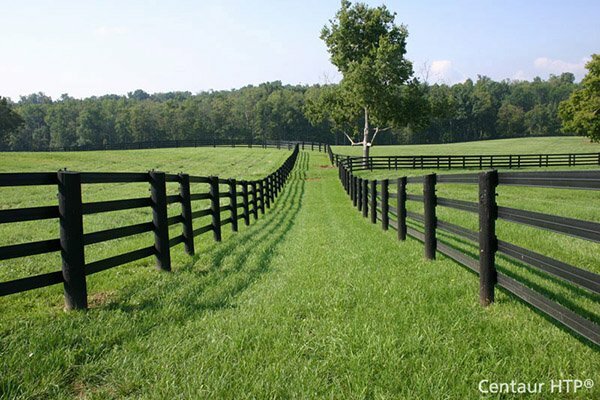 Lancaster railings are easily installed to any configuration. 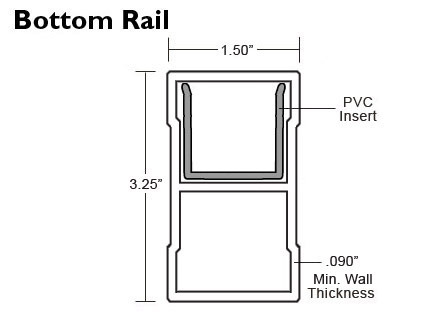 Heavy-gauge, super-strong aluminum extrusions are sold in boxed sections which include top and bottom rails, pickets, mounting brackets, and mounting hardware. Heavier components than the Key-Link Arabian and American railing for a bolder appearance. 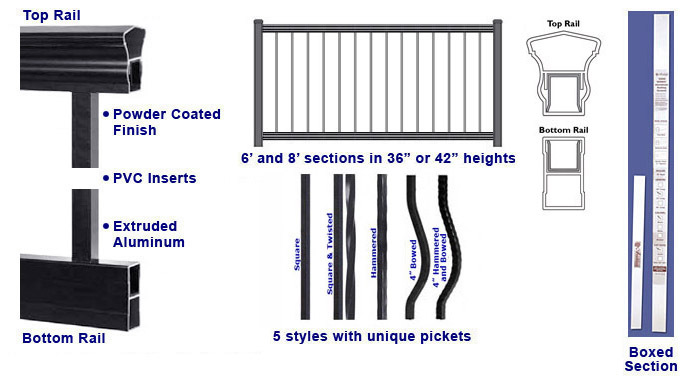 Aluminum railings are available in 3 styles with unique straight picket designs. Also 2 styles available with arched "belly" pickets. All styles come in choice of three colors. All styles available in 6' or 8' sections, heights of 36" or 42". Step sections adjust from 32° to 36°. Lancaster Railing is constructed with a heavy-gauge, super-strong aluminum for the safest and longest installation life. The screwless design provides durability and makes it easy to adjust sections to your step or ramp angles. All of our Key-Link Lancaster railing is suitable for commercial and residential applications, tested in accordance with the IBC 2012, International Building Code and the IRC 2012 International Residential Code (always check with your local building code to assure compliance before ordering). Railing is easy to assemble, even by one person. Offering exceptional versatility, the Lancaster Series is unique, heavy wall, extruded aluminum railing sold in boxed sections. Available in 36" and 42" heights, and 6' and 8' lengths in a variety of popular powder coated colors. Sections can be easily cut to size. Pickets snap into PVC inserts inside the rails to provide a sturdy, quiet connection. Sections are available for straight flat surfaces and stairs. 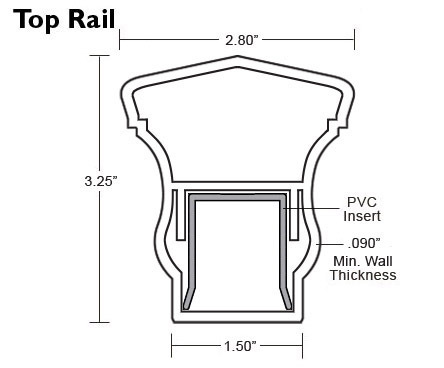 Standard step railing can be installed with a pitch of 32° to 36°. Connectors come in a variety of styles to fit any purpose. Connectors are aluminum also, stainless steel screws with color coordinated finish included. Railing has a maintenance free baked-on powder coated finish. All Lancaster railing components come with a manufacturer's lifetime warranty. 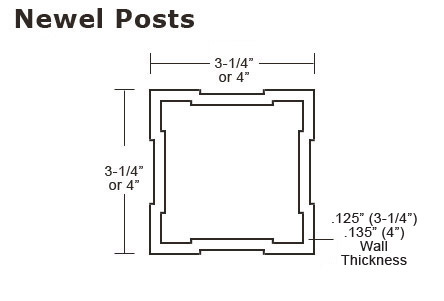 Boxed railing sections include: Top Rail, Bottom Rail, Balusters, Mounting Brackets, Hardware, and Installation Instructions. All styles use Lancaster top and bottom rails, with your choice of balusters. 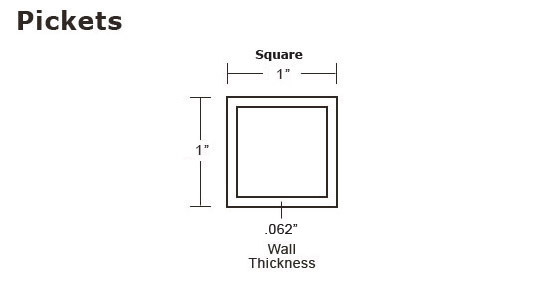 Posts are available separately in choice of 3-1/4", and 4" square sizes. Posts come with an aluminum plate welded to the bottom for installing on concrete, wood, or composite decking. Gates are preassembled and are available separately. Post Sizes - 2 sizes available (sold separately): 3-1/4" and 4"
Lancaster Series Aluminum Railing gives you a choice of stock colors Black, White, and Bronze (special order colors are available upon request - see color swatch below). Each color is a durable smooth powder coated finish for a long life. Colors are available in all the railing styles. Use the following examples to choose the color most suitable for your needs. Click to see color swatch. Lancaster Series Aluminum Railing Products meet or exceed the building code requirements of the institutions above. Always check your local codes before purchasing. 5 Picket Styles: All 1" Square, Picket Spacing 3-5/8"
Are the Lancaster railing systems suitable for above ground applications such as second story decks? Absolutely, that's what it's designed for. The Lancaster railing meets or exceeds code for IBC (International Building Code) and IRC (International Residential Code) You should always check your local codes to make sure this railing is suitable for your area. Lancaster Railing Quick Test Report Reference Guide. Who is Key-Link (manufacturer of Lancaster Railing) and are they a reputable business? What kind of warranty does the Lancaster railing have? 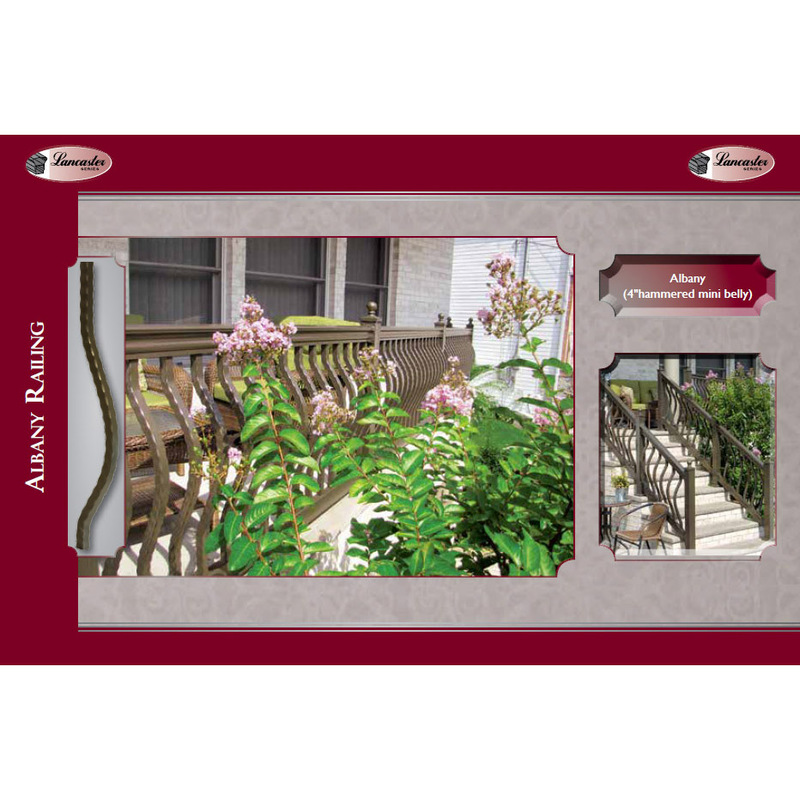 The Lancaster aluminum railing is a heavy-duty product that will last for many years. You will have no painting costs, rust or scale to scrape off, or sections to replace because of rusting, rotting, or warping that is associated with wood or iron railing. Remember: Lifetime Warranty! What kind of finish do the Lancaster Series railing products have? The Lancaster Series aluminum railing has a baked on powder coated finish. The castings have a powder coated paint finish that is far superior to any other paint surface available. How many styles are available for Lancaster railing? 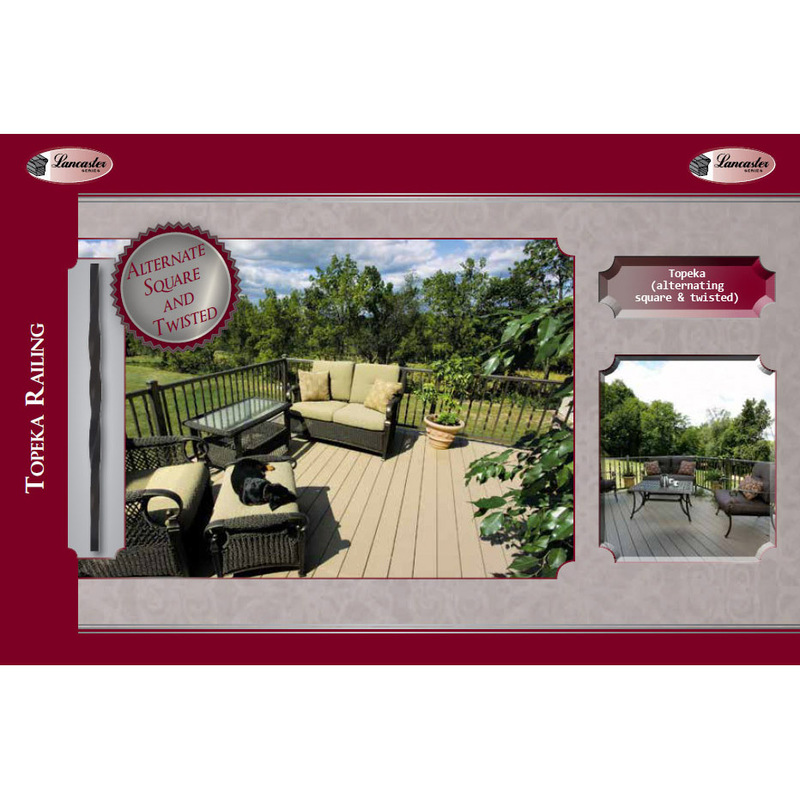 Lancaster railing comes in 5 distinct styles. The type of picket dictates the style. All other components are the same. All pickets are 1". Lancaster railing is also available with "belly pickets" which arch instead of being straight. Lancaster railing comes in standard widths of 6' and 8'. For shorter sections cut down a full section to fit. Save the extra pieces, you may need them elsewhere. The Lancaster railing sections are broke down and sold in section boxes. Pickets are easily snapped into a PVC insert that runs the length of the rails, top and bottom. This screwless design makes it easy to assemble a strong and quiet section. (Boxed sections include brackets and mounting hardware). The Lancaster railing is available in stock colors of Black, White, and Bronze. 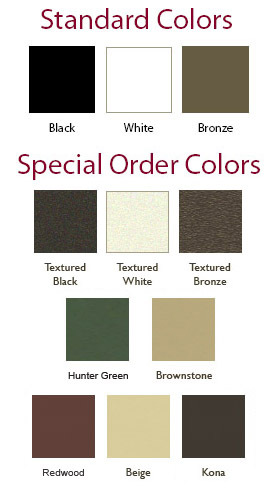 Special order colors are also available, see all available colors for more information. All fittings and screws are color-coordinated to match for a pleasant appearance. The paint has a smooth finish. 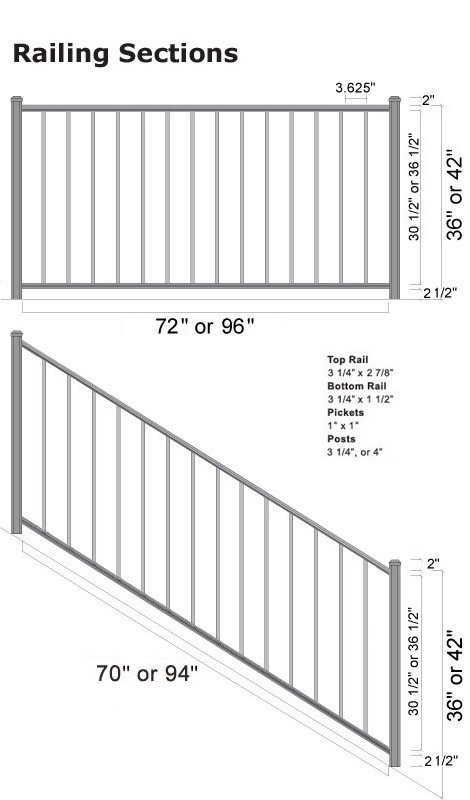 The Lancaster railing is available in 36" and 42" heights. The Lancaster railing is extremely easy to install, even by one person. Standard Newel Posts are used for most applications. A variety of post brackets (post supports) are available to be used with most applications. The posts connect to a wood or masonry platform using lag bolts or masonry fasteners, included with the supports. The railing attaches to the posts with a variety of connectors that can be used for any application. Connectors slip over the rails and attach with color-coordinated self-drilling stainless steel screws for easy installation. May be the easiest of all railing systems to install. Lancaster sections are available for flat and step applications. The screwless rails/pickets allow the section to adjust to any angle eliminating the need to order special sections for custom applications. Brackets are available for the standard 32-36 degree angle. Swivel brackets are available to make any installation simple for uneven, odd angle, or odd stair/ramp situations. Yes they can! 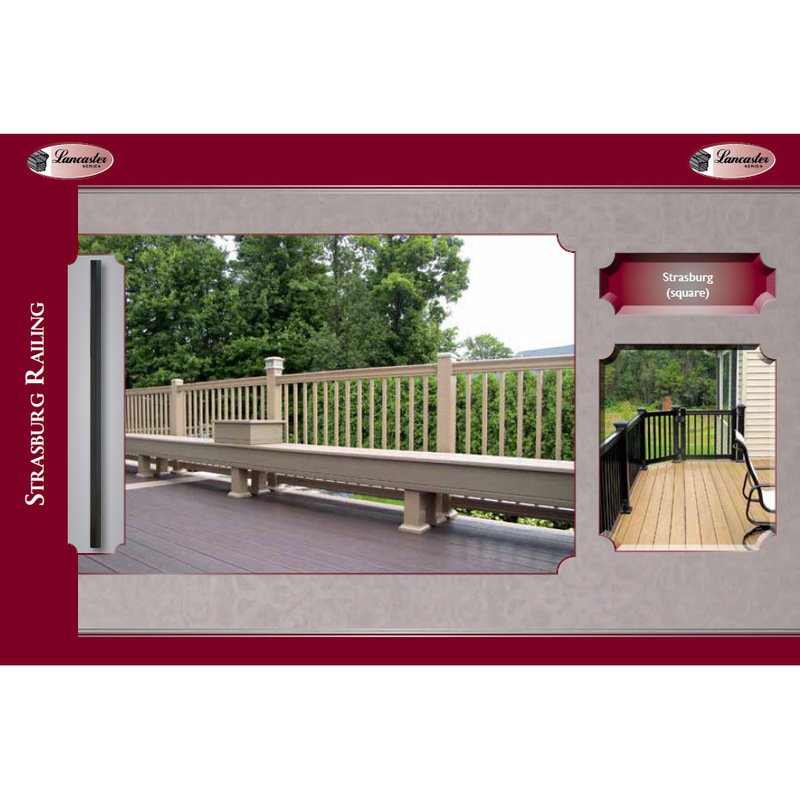 Lancaster railing uses posts with plates welded on the bottom to connect to the surface of the deck or porch. The base of the posts can be adjusted to the proper angle with shims under the welded plate before attaching to the concrete or wood surface. Trim rings cover the welded plate for a finished look. Yes, Lancaster posts have plates welded on the bottom for easy and inexpensive mounting to flat surfaces. Post supports are no longer needed, these welded posts meet the IBC or IRC codes. 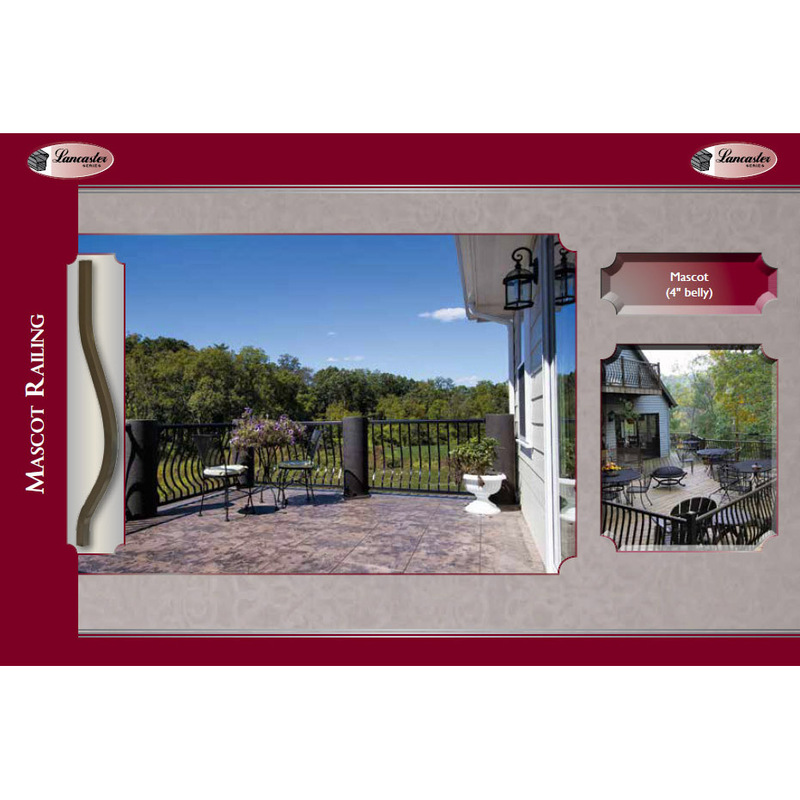 See the Lancaster Railing Quick Test Report Reference Guide for more information.